Classifications are used to organize sets of User-Defined Properties. 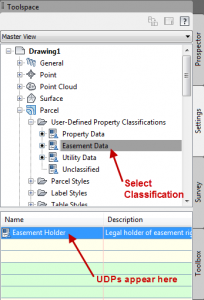 In this example, we will create a classification called “Easement Data” to hold information about easements in a Parcel. Click on the “Settings” tab of the Toolspace. 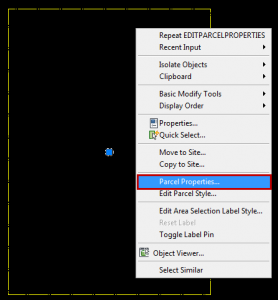 Expand Parcel and then expand User-Defined Property Classifications. 4. Enter a Classification name and click “OK”. A User-Defined Property Classification is created and will appear under User-Defined Property Classifications in the Toolspace. User-Defined Properties contain custom information fields to hold information about a parcel. 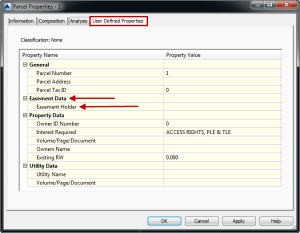 In this example, we will add User-Defined Property to the previously created classification “Easement Data”. 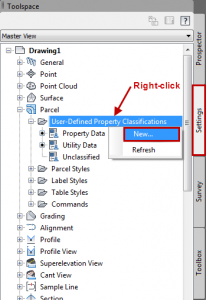 To create a User-Defined Property, right-click on a classification and select “New….”. 3. Enter Name(required), Description(optional), Property field type(required), Lower bound and Upper bound(if applicable), and Default value(optional). 4. Click “OK” to create the User-Defined Property. 5. 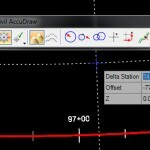 Select a User-Defined Property Classification in the Toolspace. 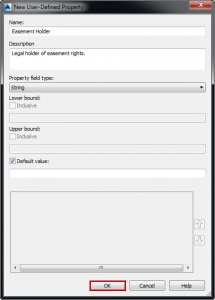 User-Defined Properties will appear in the Property List View Window below. 2. Click the “User Defined Properties” tab. 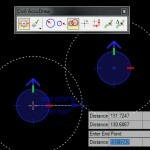 User-Defined Classifications and Properties are listed and values can be entered or edited.